“The Nut Job” ends with requisite elements of action and break-up-to-make-up scripting, stuffed with a few double-crosses and chase sequences to pad the picture. In the current state of CGI animation, projects are either massive blockbuster entries with a regal voice cast or disposable cartoons with actors taking work to impress their kids. "The Nut Job" follows last Thanksgiving's "Free Birds" in the forgettable category, with the potential of a spiraling 3D caper featuring squirrels and forest friends lost to the drudgery of formulaic screenwriting and a reliance on bathroom humor to keep younger viewers entertained. It's a bright picture with a certain Looney Tunes energy (and a love for a 2012 K-pop hit), but it's also a tedious comedy missing proper punchlines and inspired plotting, giving moviegoers something they've seen before, often in a most laborious manner. Surly (voiced by Will Arnett) is a squirrel working on his own terms, teaming with dim rat pal Buddy (Robert Tinkler) to amass enough food to survive the winter, targeting a special nut stand run by gangster King (Stephen Lang). In a nearby park, leader Raccoon (Liam Neeson) is concerned about low food stockpiles failing to feed the animal community, sending Andie (Katherine Heigl) and idiot egomaniac Grayson (Brendan Fraser) out to find new resources, with the pair soon stumbling on Surly's plan. Although Andie has faith in Surly's hidden sense of honor, hoping he'll help Raccoon and the gang, the squirrel doesn't come through, banished to the big city, eventually finding King's nut store, which is a front for the goons to tunnel their way into the vault of a nearby bank. Making friends with King's pet dog Precious (Maya Rudolph), Surly and Buddy attempt to steal their crunchy fortune, while Andie sets out to find Surly and help him restore his battered reputation. The screenplay for "The Nut Job" certainly tries to find things to do with its cast of characters. A mix of adventure and comedy with heavy redemptive qualities, the feature isn't merely about Surly's quest to secure a wealth of nuts, but follows the concerns of the park creatures under Raccoon's leadership, Andie and Grayson's accident-prone hunt, and King's mounting criminal enterprise, employing a few goons to help with the bank job – one being particularly sensitive to dog whistles. There are more than enough subplots to keep the effort busy, taking it to potentially unexpected places as we watch Surly attempt his nut heist in a most colorful manner. Sadly, the screenplay isn't up for the challenge, always reaching for hackneyed conflicts and tedious resolutions to nearly every tangent, sticking to the family film playbook without a level of creativity to help distract from the lack of originality. The Nut Job" is a cartoon, with animation that focuses on the flexibility and indestructibility of its characters, with Surly a particular ball of slapstick and expression. Craftsmanship is capable with a lower budget, and while textures of the frame are flat, the collection of animals is cared for with distinct emotions and physical personality, making some of the purely cinematic scenes amusing to watch. Director Peter Lepeniotis seems eager to craft a madcap picture concentrating on zany creatures in a mad dash for food, colliding with humans who are up to no good, but the story doesn't have the drive to find a pleasing rhythm of screen mischief, while supporting characters, including a park digging squad consisting of a mole (Jeff Dunham) and two groundhogs, are here strictly for farting purposes, adding maddeningly lazy humor to an already unfunny movie. Confusing is the setting of "The Nut Job," which appears to take place in the 1950s, offering architecture, automobiles, and character costuming to secure the time stamp. However, the movie offers product placement from modern brands, while using an instrumental version of Psy's "Gangnam Style" to backdrop Surly's euphoria when he discovers King's nut empire. An animated version of Psy even pops up in the end credits, securing some eye rolls as Lepeniotis misses the sweet spot of a musical trend by almost a full year. Not that a picture like "The Nut Job" should adhere closely to period trappings, but why bother to introduce a specific era if there's no interest in staying there? The 1080p transfer is really solid. The animation is not Pixar quality but it is well-done. There is no shortage of color in the film for sure, especially having a purple squirrel. But what it lacks is a certain "smoothness" that Pixar films have. There are a few scenes that look a bit choppy. The DTS-HD Master Audio 5.1 tracks works with the comedy, as well as the action and music. The bombastic hilarity of the squirrels excitable nature plays well throughout the front and rear speakers. "The Nut Job" ends with requisite elements of action and break-up-to-make-up scripting, stuffed with a few double-crosses and chase sequences to pad the picture. It's not terribly exciting filmmaking, though some of the voice work is pleasing, with Arnett and Heigl making positive impressions, and the talented Rudolph is always welcome, even if she can't make her dull jokes land with any impact. I suppose that's why "The Nut Job" grows increasingly obsessed with flatulence humor, as the feature flatlines quickly, desperate to do anything that might trigger a reaction out of the audience. Considered, thoughtful screenwriting has no place here. Download The Nut Job from the iTunes Store in Digial HD. 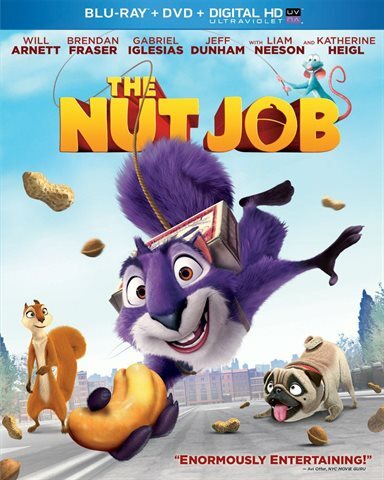 For more information about The Nut Job visit the FlickDirect Movie Database.